Zoo Sounds for iPhone for $.99 from Alex Lindsay. Shure X2U XLR-to-USB Signal Adapter forÃ?â? ?Ã?Â $129 from Alex Lindsay. 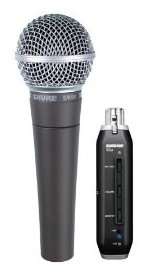 Shure SM58-X2U Cardioid Dynamic Microphone with X2U XLR-to-USB Signal Adapter for$180 (on Amazon) from Alex Lindsay. Roku Digital Video Player for $99.99 from Andy Ihnatko. AliceX for iPhone for $1.99 from Andy Ihnatko. Darkness for iPhone for $1.99 from Scott Bourne. Nose Down, Eyes Up: A Novel from Any Ihnatko. You don’t have Leo’s picks, Bento app and Myst. Does anyone else sometimes wish Leo would stop interrupting everyone with his (often incorrect) assumptions? Honestly, I love these guys, but After the third or fourth time he interrupted the explanation about the NIN app – with a completely off base assertion – I was pulling my hair out. It was painful to listen to, and this happens every other episode or so. Please, Leo, you have these guys on for a reason, why don’t you just let them talk without having to jump in and talk all over them?